CCNB is as mobile as you are! Manage your personal finances anytime, anywhere from your mobile device. It's fast, secure and convenient. * Bill Pay requires activation. Carrier data rates may apply. 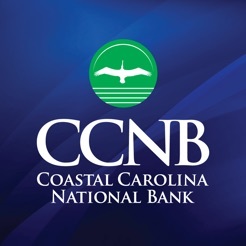 ©2017 Coastal Carolina National Bank. All rights reserved. This is a nice app, but now that there is mobile deposit for checks makes it an essential app for me. Easy to use and easy to see all accounts, wish the password sign in font was a little darker. Love the new app upgrade. Mobile deposit is super easy. The only thing missing is mobile deposit.